Hello to all my coffee-loving friends! Today I'm sharing a sweet card I made for the Winter Coffee-Loving Cardmakers Blog Hop using lots of fabulous products from Paper Sweeties. 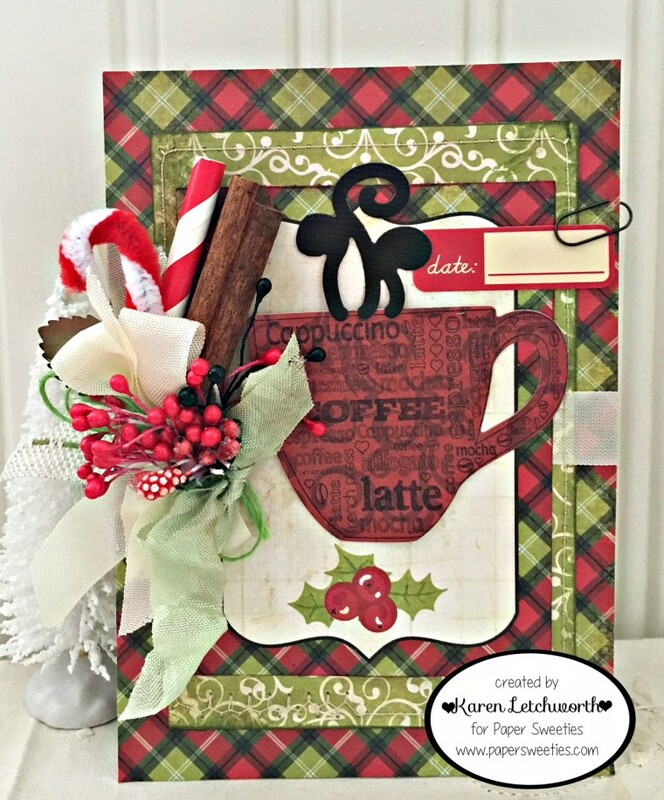 Paper Sweeties is once again a Super Sponsor ($25) and Flash Prize Sponsor (stamp & die of choice) for the Winter Coffee Blog Hop. Now that's a coffee treat worth celebrating! Like many of you, I start every day with coffee. My personal favorite is a Vanilla Spiced Latte with whipped cream and nutmeg on top. Today I'm sharing a card that not only features a latte; but it also features lots of my favorite coffee stamps and dies.....from Paper Sweeties! And Paper Sweeties helped me make it extra delicious for you! I started with some Echo Park patterned papers and journalling card that I inked and machine stitched together. I stamped and cut the coffee mug and steam from the Keep Calm and Drink Coffee Stamp Set; and I cut it out using the coordinating Keep Calm and Drink Coffee Sweet Cuts. I added a journalling date sticker, a rusty paper clip, and a big beautiful ribbon treatment using some Mint Seam Binding and Frosting Seam Binding. Then, just for fun, I popped in a cute piece of a Strawberry Paper Straw as well as a Red & White Chenille Candy Cane and a real cinnamon stick. Every little accent that I added just kept making it cuter and cuter. Paper Sweeties has everything YOU need to make something extra sweet as well. There are so many fabulous products in the Paper Sweeties Shop, and I hope that you will take time to browse through the store and treat yourself to something new.....whether it's one of our many sweet coffee-related sets, or anything else. It's also a great idea to make a little "Wish List" to give your hubby so that you don't end up with another hand mixer or pair of ugly slippers again this year. LOL We sure hope that you will stop by often. We enjoy your visits! 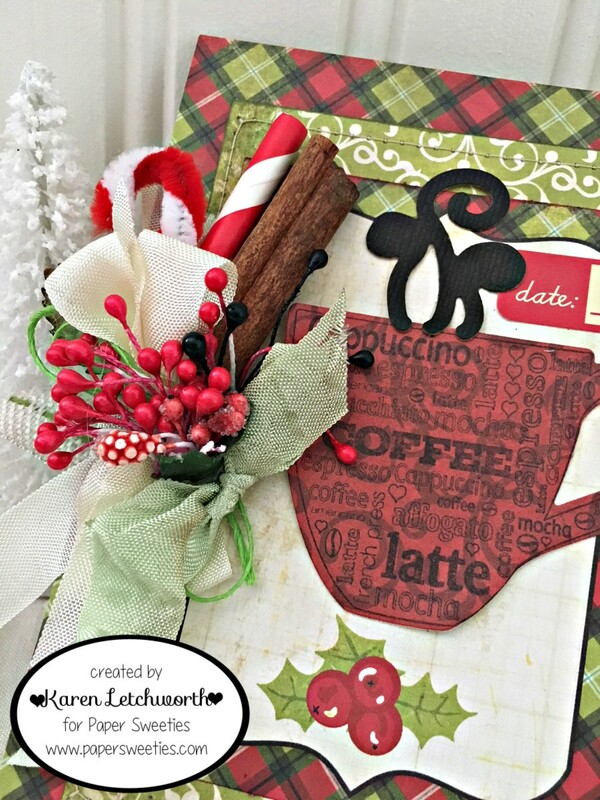 Winter Coffee-Loving Card Makers Blog Hop - Anything coffee. tea, or cocoa related with a Winter theme. Beautiful card Karen, Love those paper with the coffee image. Gorgeous embellishment. Another fun creation, love this coffee mug with all pretty elements! You do beautiful work. This is gorgeous. Amazing creation! Love the warm tones and the traditional colors! fabulous design and embellishments! Gorgeous Karen! Love that cluster of goodness! love the little cinnamon sticks and the little candy cane. Oh Karen, this is absolutely gorgeous! 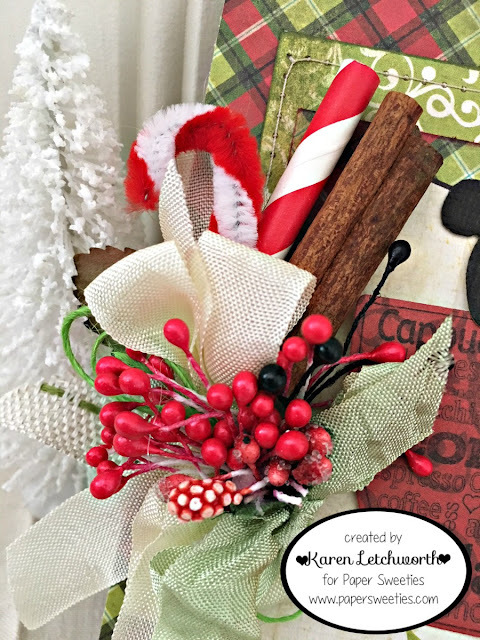 I love, love, love that little collage you created with cinnamon sticks/peppermint! So pretty! beautiful. love the red/green plaid and wonderful dies and sprigs. beautiful. Gorgeous! Love everything you've added! and that is one of my favorite cups! Your embellishing touches are so fabulous! I love to see your little bouquet creations right on your cards! BEAUTIFUL! Love the layers and embellishments. This is so beautiful, Karen! I can smell the real cinamon stick! Awesome card! I love the cinnamon sticks! Not only lovely but delicious too!